I guess I just don't know how to read a tweet, but this one trails off into ... meaning what? Luckily, I don't get tweets, so Peak Stupidity would have to be subpoenaed the old fashioned way (catching me on the front lawn unarmed). The one above, though, came via a Steve Sailer post snarkily called Atlantic: "Hardy Boys" Are Intersectionally Problematic. 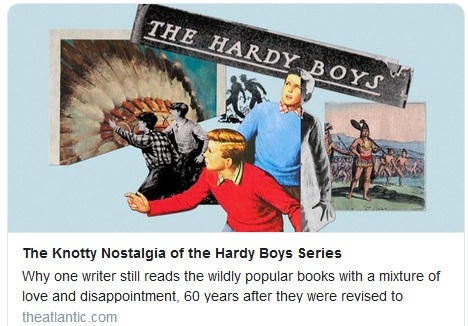 The Atlantic still has a problem with the super-normality of the Hardy Boys, two boy detectives that existed in the imagination of young kids, reading the large series of books. These Hardy Boy books let the reader try to figure out the mystery first, before the always unusual trick used in a crime is revealed by the 2 clever Hardy brothers. I'd guess the books wouldn't have been as exciting if the cases were taken from the Southside Chicago PD blotter - "It was another case of a 5-count black felon leaving his cell phone at the scene of the crime." Next book in the series: "The case of the Mexican with multiple IDs." Nah, you've got to sell the books. Stupidity and repetition doesn't sell to bright young boys. Heh! I did find my memory of Encyclopedia Brown and the Case of the Secret Pitch reviewed, not very favorably, I might add. ONE character was gay? Are you serious?! * This blog post was from 10 years back, but I'll have to do some reading to see if the guys still writes (and this well). PS: Oops. I meant "... YOUR disappointment that Christmas ..."
PS: I guess our first purchase was baseball cards with that delicious bubble gum strip that had some kind of powder blowing off of it. Lots of times it was hard as a rock. I do remember other kids having lots of Revell car and airplane models. I LUVED, LUVED, LUVED the smell of that glue, banana mixed with, I dunno. As far as our disappointment that Christmas, you bring up a funny comment on the unz site under this article. Expounding on theme of the Hardy Boys tweets, the guy wrote (to paraphrase) - they will come out with some books combining efforts of the gay Hardy Boys and Nancy Drew, titled "The Nancy Boys" series. Hahaaa! PS: As Sherlock Holmes said, "...ah, now, this really is something a litte recherché." The first independent purchase (aside from cola, candy and comics from "the little green store" as it was known to us--a little neighborhood grocery store a block away, kind of precursor to the convenience store but nicer because not of cookie-cutter design) was when I was given one dollar (!) to go to the nearby shopping center and buy a toy at the Toy House, which was filled to the rafters with toys to include my favorites: model military planes, tanks and ships. Don't know how long I walked around that toy story looking at the Revell models and maybe they were out of my price range, but the nice lady behind the counter remarked at how long I had been grasping the dollar in my hand because the bill was warm. She also said she was happy to see me buying a book, as that was a little unusual for the customers. Of all the goodies in the store, I had bought a Hardy Boys book, and I was hooked. If I didn't read every one of them I came close. One of the biggest disappointments of my life was one Christmas I had asked for a Hardy Boys book, and Santa brought me a Nancy Drew because that was all Mom could find. About ten years ago, I bought three of Hardy Boys books hoping my grandson would like them. He didn't, but was probably a little young at the time. In any case, he is a habitual reader--his school encourages constant reading--and I think that is a great foundation for his future. I may try him on Encyclopedia Brown. I am not familiar with those books, don't know how I missed them, but they would have been right up my alley. The Amazon link you provided shows a copyright of 1963 so they probably hadn't got going before I moved on to a more sophisticated (well, different) class of literature.